Liam's right eye has been turning in since last October. His ophthalmologist said she thought it was a good thing because he was probably trying to focus and understand what he is seeing since he has "cortical visual impairment". There had been a discussion on the preemie group I am a part of about patching lazy eyes and it got me to thinking about Liam and whether he should be patched for his eye. We don't have an appointment at Duke with the ophthalmologist until June and I didn't want to wait that long so I made an appointment with a local optometrist. I am SO thankful I made that appointment. At our last eye exam I was told that Liam was only slightly near sighted (-2). Dr. Doty told me today that Liam is VERY near sighted (-12) and that he can't see anything clearly beyond his nose! Poor baby! No wonder he lost interest in his books. He can't see them clearly! She explained what Liam's eyes are doing. He actually turns both in (which I didn't even know) and she explained that he is only focusing one eye at a time. By only focusing one eye at a time he is over focusing and losing the focus of the opposite eye. 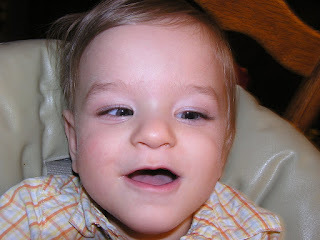 He has the diagnosis of Esotropia and not the amblyopia which is what I was afraid he had. You can see in these pictures not only his dilated eyes from the exam but how his left eye is turned in. These two photos show his right eye going in. Liam did very well for the eye exam. Dr. Doty took approximately two seconds to say he was very near sighted. I couldn't believe how quick it was. The dilation part went great. She said he was the first patient of the day who didn't cry when the drops went in (such an easy goin' boy). But, hoooo boy, did he throw a fit when she tried to see in once they were dilated! He sure showed her how mad he was though...by throwing up his peas. We fit Liam for his glasses today. Everyone oohed and aahed over him and said he looked so cute in them. They put a rush on them so hopefully we will have them within the next week. I am not sad to see Liam get them. I am thrilled that we can still correct his issues with vision and that he now will have a chance to see beyond his nose. 90% of what a child learns in their first year of life comes from vision and if we can increase his percentage by the slightest bit we have given him an advantage. Besides, glasses are just the window dressings. And if that wasn't exciting enough today, my Dad's dog was attacked by a neighbors dog and we had to take him to the vet. He had a good size tear in his side. The muscle got pulled away. He's in a lot of pain. They will be putting a drain in tomorrow and he is on pain meds and antibiotics. He can't walk well due to the muscles and my dad's room is upstairs and picking him up isn't an option. He just hides in the corner down here. The poor guy won't even move right now at all. He is too stinkin cute!! And the glasses will be even cuter. It blows my mind how they fit little ones with glasses. When they ask me if option "a" or "b" is clearer I have to think about it a second. How do they figure it out? Aurora had glasses on 15th jen and she improve a lot, she is -14 both eyes ;( glasses help a lot!!!! she keep glasse also in swimming pool!!! Elizabeth barfed on her eye Dr. too. The Dr. was not too impressed and I was scared(the eye Dr. reminds me of Hagrid from Harry Potter but she is female).